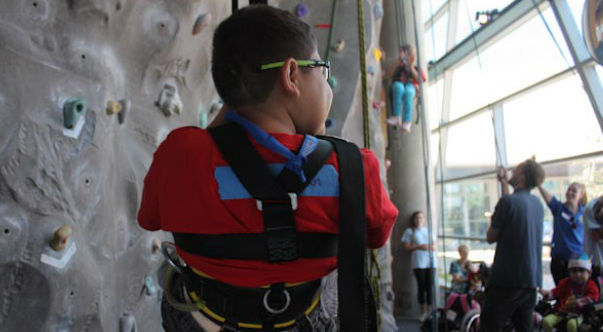 Every summer, about 45 children and teens with disabling diseases, disorders and spinal cord injuries come from far and wide to the UCSB Recreation Center for a week of intense sporting organized by Santa Barbara Cottage Rehabilitation Hospital. They play basketball and volleyball, racquetball and rugby. They go swimming and handcycling, and have tennis lessons with three-time Paralympian, Anthony Lara. They also engage in adventure activities such as kayaking, ropes course, SCUBA and, of course, what kind of sports camp would be complete without rock climbing? Real interest in adaptive climbing has been sparked among many wheelchair users across the globe. Perhaps it is the sport of rock climbing becoming more mainstream, or maybe inspiration from famous disabled athletes such as blind mountaineer, Erik Weihenmayer, incomplete tetraplegic competition climber, Fran Brown and the more recent scaling of El Capitan by Stephen Wampler, who has cerebral palsy. Either way, despite the growing interest, working with people with disabilities is still a very complex and out of the ordinary thing for most vertical sports professionals and high angle rope workers. The Junior Wheelchair Sports Camp has both excited and panicked me for nearly a decade. Beyond the usual concerns that come with any children’s program, including the naturally worrisome parents and doting caretakers, each year purports a completely new test for me and my staff. The kids come to us both excited and terrified themselves, and we are responsible for the quality of their experience. Written by Vapur Pro Team member, Laura Bylund. Each critical system has major threats that could lead to failure and if that happens to of any one of them, the three-legged stool falleth over. With the respiratory system, we worry about obstructions and broncospasms that lead to respiratory distress. With the nervous system, we fear increased intracranial pressure and other threats to brain function, as well as spinal cord injuries. The circulatory system’s nemesis is volume and vascular shock. This is where blood volume decreases in relation to the size of veins and arteries; the ultimate worry is that blood pressure will drop so low that it is unable to adequately perfuse the body’s organs with that crucial oxygen. While volume shock is certainly caused by severe bleeding, the most common danger to the circulatory system is actually dehydration. Vapur was the exclusive water bottle of the Reel Rock Film Tour screening in Santa Barbara on Wednesday, November 14th. Organized by award-winning, even Emmy-nominated filmmakers, this climbing film tour has joined the ranks of the best adventure film tours in the world, now even outperforming most of them in its 7th year. This leg of the tour is hosted by the official outdoor program at the University of California Santa Barbara and has been held in Isla Vista Theater, one of the largest venues of its hundreds of stops worldwide, since the tour’s inception. On October 6 and 7, with a little help from the Vapur Element Anti-Bottle, a team of adventurers from the University of California, Santa Barbara braved a few good canyons in the San Gabriel Mountains of the Angeles National Forest.